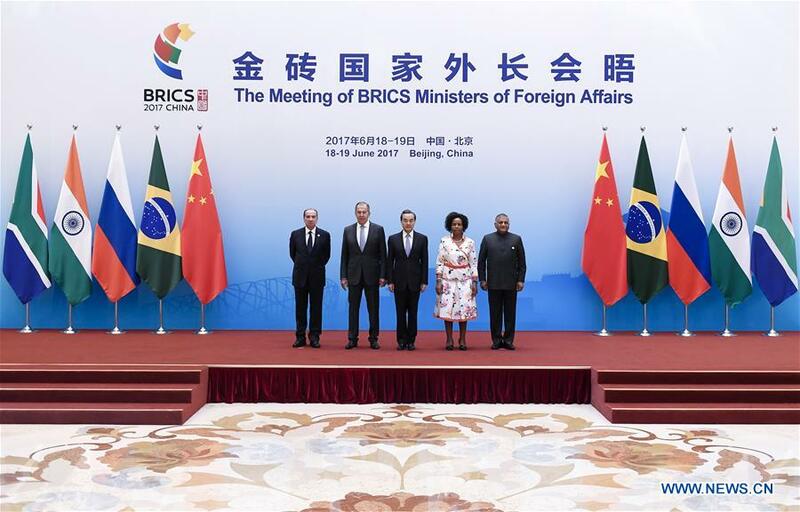 BEIJING, June 19 (Xinhua) -- Chinese Foreign Minister Wang Yi said Monday that the BRICS cooperation has shown strong vitality during the past ten years. Wang made the remarks at the opening ceremony of the meeting of BRICS Ministers of Foreign Affairs and International Relations, attended by Russian Foreign Minister Sergey Lavrov, South African Foreign Minister Maite Nkoana-Mashabane, Brazilian Foreign Minister Aloysio Nunes and India's Minister of State for External Affairs Vijay Kumar Singh. He said BRICS cooperation has greater importance, as the five countries' share in global economy has increased from 12 percent to 23 percent in the past decade while they have contributed more than half of global growth. Trade and investment among the five countries have increased sharply, and their cooperation expanded from economy to political fields and people-to-people exchanges, Wang said. The BRICS countries have strengthened coordination within the UN and G20 framework to safeguard the interests of developing countries, and contributed wisdom to cope with global challenges, he said. This year marks the beginning of the second decade of BRICS cooperation, and China holds the BRICS rotating presidency, Wang said, adding that the country stands ready to work with all sides to contribute to worldwide stability and prosperity, as well as the healthy development of multilateralism. A media note published at the meeting said that the ministers commended the fruitful cooperation forged in the past and look forward to continued and positive cooperation among BRICS countries. They appreciated the work by China as it holds BRICS chairmanship for 2017, and reiterated their commitment to the success of the Ninth BRICS Summit under the theme of "BRICS: Stronger Partnership for a Brighter Future," it said. The ministers recommitted their strong support to the central role of United Nations in international affairs, and committed to strengthening the coordination and cooperation among BRICS in the areas of mutual and common interest within the United Nations and other multilateral institutions, including through regular meetings among their permanent representatives in New York, Geneva and Vienna, and further enhancing the voice of BRICS in international fora. On the 2030 Agenda for Sustainable Development, the ministers underscored the importance of its full implementation within the framework of revitalized global partnership for sustainable development. The ministers also welcomed the entry into force of the Paris Agreement on climate change on 4 November 2016 and urged all countries to implement the Paris Agreement under the principles of the United Nations Framework Convention on Climate Change including the principles of equity and common but differentiated responsibilities and respective capabilities. On terrorism, they deplored the continued terrorist attacks, including those in some BRICS countries, and condemned terrorism in all its forms and manifestations wherever committed and by whomsoever. The ministers highly valued the Second BRICS Counter-Terrorism Working Group Meeting held in Beijing on 18 May and called for an expedited adoption of the Comprehensive Convention on International Terrorism in the UN General Assembly. On international and regional issues, they supported political and diplomatic solutions for conflicts, such as those in Libya and on the Korean Peninsula, and promoted preventive diplomacy in a consensus-based manner. The ministers looked forward to their meeting on the margins of the 72nd Session of the United Nations General Assembly, and welcomed South Africa's offer to host the next stand-alone meeting in 2018.